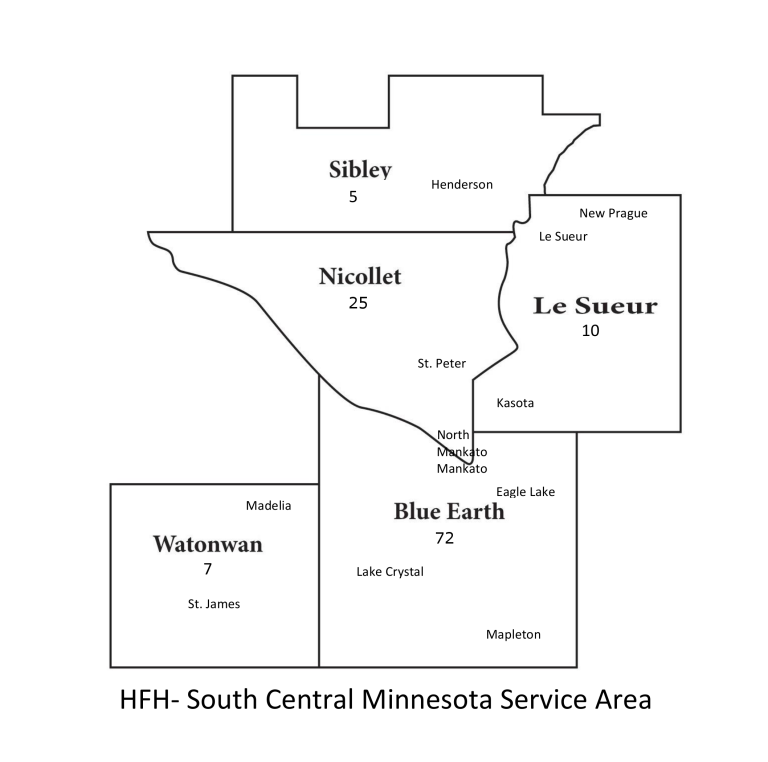 Habitat for Humanity of South Central Minnesota serves five counties: Blue Earth, Le Sueur, Nicollet, Sibley, and Watonwan counties. The Affiliate typically builds six to eight homes a year. As of 2016, the Affiliate had built 119 homes, serving over 500 individuals. Partnering Community Committee members meet monthly as a collective group of volunteers representing their local service area. Partnering Community Committee opportunities are available in Le Sueur, Sibley, Nicollet, Blue Earth, and Watonwan Counties. The committee members serve as the backbone to local Habitat builds, aiding in the planning, fundraising, family selection, family support, and building phases. Each Partnering Community Committee is comprised of a Committee Chair serving on the Affiliate Board (main governing Board for entire service area), A Vice Chair, Treasurer, and Secretary. Please visit the Committee Member Opportunities page or contact us for more information. Monday – Friday, 8 a.m. to 5 p.m.
Habitat for Humanity of South Central Minnesota is an equal housing lender.